Gerald "Gerry" Rafferty was a Scottish singer songwriter best known for his solo hits "Baker Street", "Right Down the Line", "Days Gone Down", "Night Owl", "Get It Right Next Time", and with the band Stealers Wheel, "Stuck in the Middle with You". Rafferty was born on April 16, 1947, in Paisley, Scot land, to an Irish father and Scottish mother. Rafferty's early exposure to music included the Irish rebel songs his father sang, despite being deaf, as well as Catholic hymns, traditional folk music, and 1950s-era pop. By the time he was in his twen ties, Rafferty had begun writing songs of his own and playing in local bands. In 1968, after a concert by the duo the Humblebums in Paisley, Rafferty asked the group's frontman, Billy Connolly, to audition some of his tunes. Connolly not only agreed , but eventually invited Rafferty to join the group. Rafferty's increasing prominence in the group prompted the departure of guitarist Tam Harvey, but Connolly and Rafferty recorded two albums together, The New Humblebums and Open up the Door, both on the Transatlantic label. The group's live performances grew in popularity, due in large part to comic interludes provided by Connolly, but the comedy routine created conflict between him and t he more serious Rafferty. The group disbanded in 1971, and while Connolly went on to become one of the United Kingdom's most popular comedians, Rafferty released the solo LP Can I Have My Money Back?, in order to fulfill c ontract obligations with Transatlantic. Rafferty subsequently formed Stealers Wheel with vocalist/keyboard player and fomer schoolmate Joe Egan, who appeared on Can I Have My Money Back?, and drummer Roger Brown. Guitarist Rab Noakes and bassist Ian Campbell fle shed out the band's original lineup, but by the time the band entered the studio to record their first LP, Rafferty and Egan were the only remaining members. Guitarist Paul Pilnick, bassist Tony Williams and drummer Rod Coombes joined the pair on th eir self-titled debut album, released on A&M in 1972. Despite the album's imminent success, additional personnel changes ensued. Rafferty left the group prior to the album's release and was replaced by Luther Grosvenor. Delisle Harper repl aced Williams on tour. "I was going through a very strange period in my life right then," Rafferty explained in Rolling Stone. "I'd got married, had a child, I was twenty-four, and one day it was like I'd been living in a dream for six or eight years and suddenly I woke up. It was a pretty scary kind of feeling. Perhaps I was on the edge of a nervous breakdown---that's how it felt, anyway. I just had to get away, away from groups, managers, re cord companies, the whole thing." The tumult did not affect record sales. Stealers Wheel hit number 50 in the United States and the song "Stuck in the Middle with You" became a million-selling single that broke the top ten in both t he U.S. and U.K. markets. The mockingly paranoid tune, with lyrics that drew on both Bob Dylan's popular distaste for authority and Rafferty's frustration with the business end of his profession, enjoyed renewed popularity in the 1990s when it was featured in Quentin Tarrantino's film Reservoir Dogs. The band experienced another personnel shift when Rafferty rejoined the group at management's urging, prompting Grosvenor, Combes, and Pilnick all to depart. At that point, Stealers Wheel officially became a duo comprised of Rafferty and Egan, with a rotating cadre of backup musicians. The arrangement did not prove a charm, however; the group's follow-up album Ferguslie Park, named for a district in Paisley, met with lackluster sales and signaled the band';s demise. Rafferty and Egan recorded Right or Wrong in order to fulfill contractual obligations, but parted ways before the album's release. The pair remained embroiled in legal controversies with their respective managem ent companies for the next three years, and neither was permitted to record during that time. Rafferty emerged from the recording embargo with his most critically lauded effort to date, the solo LP City to City. The album was largely buoyed by the success of the single "Baker Street," a mournful tune wh ich drew its name from a London street where friends of Rafferty's lived, and featured an iconic saxophone interlude by Raphael Ravenscroft. The album hit number one and sold over four million copies. Rolling Stone noted, "For all their rhythmic variety . . . these are uniformly majestic songs." In an interview with Melody Maker, Rafferty recalled that there was some debate as to whether "Baker Street" should be the first single. "It was my choice as the first single though the record company thought differently---they chose 'City to City' because it had a catchy chorus," he explained. "But I did feel good about 'Baker Street' righ t from the start. It's not so much a good song as a good record." The success was more than he imagined or asked for, he told Melody Maker: "I didn't want to expect anything. I would have been quite happy if the album had sold a respectable figure like 500,000 worldwide. I'd have been doing pretty well. You just write the best songs you can and do your best and see what happens. I thought the songs were good, but I didn't expect this." The popularity of City to City thrust Raffert y into the spotlight, a place where he was notoriously uncomfortable, and he not only kept interviews to a minimum but refused to tour America in support of the album. Staying out of the public eye, coupled with label problems, did little for sales of Rafferty's subsequent efforts. While the follow-up to City to City, the United Artists' release Night Owl, fared well, sales of Rafferty's fourth solo album, Snakes & Ladders, also on United Artists, faltered. When EMI purchased United Artists, Rafferty was dropped and has not recorded with a major label since. He has continued to record steadily, however. Taking advantage of technology not even dreamed of when he had his first hit, Rafferty released Another World on Icon Music in 2000, distributing the album exclusively via the Internet. The album was inspired by Rafferty's world travels and was recorded over two-and-a-half years in London, Scotland, Barbados, France, and Tuscany. "My heart and soul have gone into this album, and by releasing it in this way my creative influence has not been diluted in any way," Rafferty said in a London PR Newswire release. The renegade distribution method is in keeping with Rafferty's long-held image as an industry skeptic, a depiction that he described in a 1979 Rolling Stone interview as only partially accurate. "This whole thing about me 'working within the confines of the music industry'---it's all gotten a bit out of hand," he said. "The image is correct to a certain extent. But it isn't as if I'm trying to start some crusade. Everybody who works as a musician has had exactly the same kind of problems I've had. I don't believe I'm so isolated or uniq ue in any way. It's just that from time to time I've put those experiences down in the form of a song." In 2009 Rafferty released Life Goes On, again on Hypertension. This album features a mixture of new recordings, covers of Christmas carols and traditional songs that had previously been available as downloads on his web site, and edited tracks from his previous three albums. He died at his daughter Martha's home in Stroud, Gloucestershire on 4 January 2011 of liver failure. 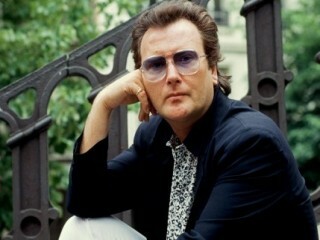 View the full website biography of Gerry Rafferty.